There are a lot of dorm necessities to think of as you are making your college dorm checklist. Your head may even be swimming with ideas and you keep having to write things as you think of them on sticky notes to add to your master college dorm checklist. You may be so focused on dorm necessities like your college dorm bedding and extra Twin XL Sheets (not to mention your dorm room decor!) that you simply don't think of certain college supplies. You may not know your dorm room floor is linoleum and that you need a dorm rug, and you may not know that your college dorm room is going to have very few electrical outlets. When you combine that with the fact that you need to share those outlets with your college roommate, you may end up with as little as four dorm electronics that you can plug in. 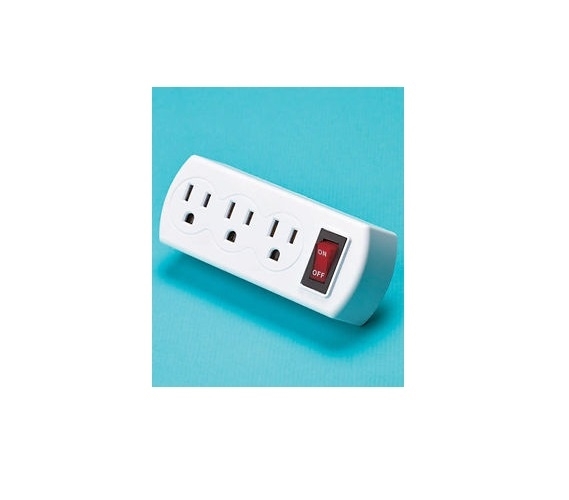 Make sure you're prepared for college with a few of our Energy Saving 3 Outlet Adapter. Our Energy Saving 3 Outlet Adapter will allow you to turn one outlet into three and maximize the amount of college electronics you can plug in. You don't want to unplug one dorm item to plug in another. Doing that will get old very quickly. With our Energy Saving 3 Outlet Adapter, you don't have to worry about switching those items around constantly because you'll be able to have everything you need plugged in at once. This dorm essentials item doesn't just expand on the amount of dorm electronics that you can plug in. This handy dorm necessity is also energy saving and has an on/off switch to turn off standby power to unused dorm electronics.